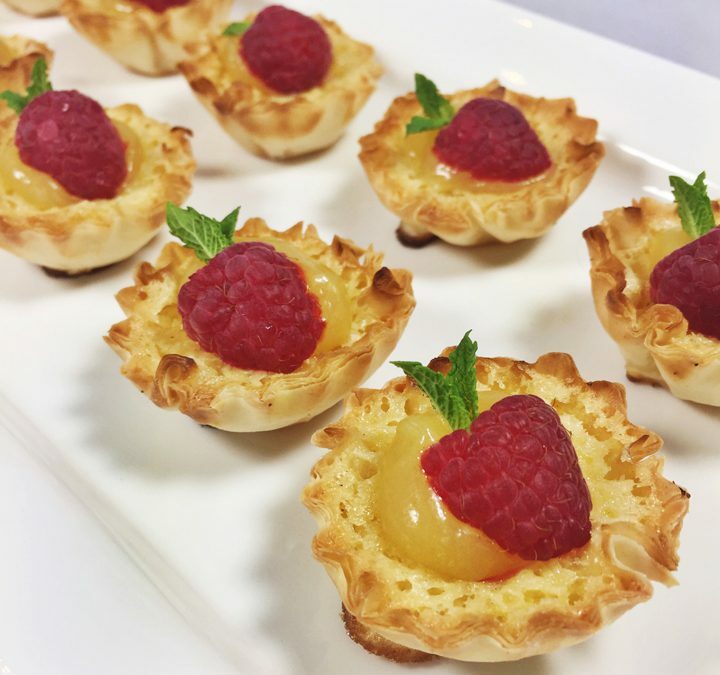 Perfect for spring or summer parties, these quick and easy tartlets make a tasty treat for any social occasion. The recipe comes together is a short time and can be refrigerated until ready to serve. You can make your lemon curd or use a high-quality jarred version such as Williams-Sonoma, Stonewall Kitchens, or Wilkin and Sons. Preheat the oven to 350 degrees. Set the frozen filo shells on a cookie sheet. Add the butter and sugar to a large bowl. Using a hand mixer, combine them until light and fluffy. Incorporate the eggs and mix in well. Add the flour and mix until combined. Add the buttermilk, vanilla, and cinnamon, mixing again until well combined. Carefully spoon into the filo cups. Bake for 15 minutes and then cool completely. When cooled, add ½ teaspoon of lemon curd to each cup. Top with ½ of a raspberry and mint sprig, if using. Keep chilled until ready to serve.